Blambot’s September Font, Irish Stout, now available! Our good friends at Blambot Comic Fonts have poured us a delicious new serving of typographic goodness this month in the form of Irish Stout! Well done, Mr. Piekos! Sláinte! ComiXpress gets the Heebie Jeebys! Heeby Jeeby Comix was created by a group of cartoonists who set out with the simple idea to bring back the wonder and weirdness that is sometimes missing from comics these days—especially for kids! As the name suggests, the comics tell of unusual and bizarre stories—a cartoony blend of cute, funny, and creepy. This first issue features comics by the current crew of Heeby Jeeby cartoonists: Chris Houghton, Bob Flynn, David DeGrand, and Dan Moynihan. 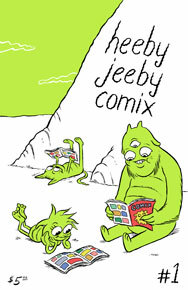 Visit the Heeby Jeeby Comix blog for the latest comics and news! Heeby Jeeby Comix #1 is now available in the ComiXpress store.